Microsoft is working on a pocket-sized dual-screen Surface device according to information sourced from Microsoft internal documents and shared by The Verge. 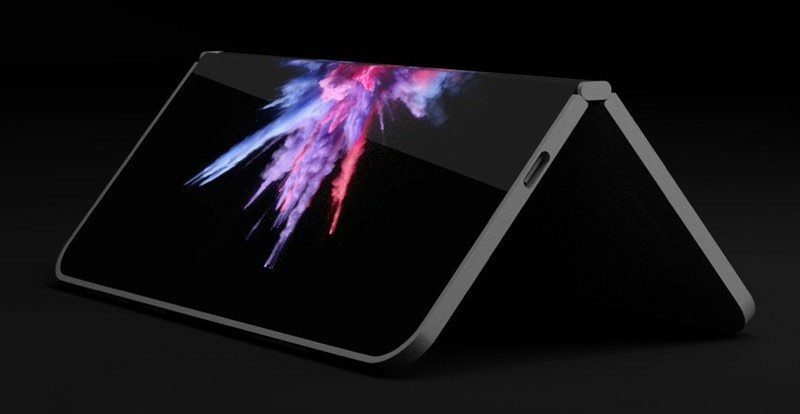 Called Andromeda, Microsoft's dual-screen Surface project has been in development for at least two years and it's designed to "blur the lines between mobile and stationary computing," according to an internal document. "It's a new pocketable Surface device form factor that brings together innovative new hardware and software experiences to create a truly personal and versatile computing experience," is exactly how Microsoft describes the device internally. Microsoft's device will feature a wraparound display that bridges the gap of the hinge when it is fully opened, and according to The Verge, December renderings shared by David Breyer are "identical" to the current prototype versions of the upcoming Surface. The pocketable Surface can be folded in either direction or laid flat, as can be seen in the renderings. The Verge's sources warn that work on Andromeda could be ceased at anytime, but Microsoft is said to have tentative 2018 release date plans, which would mean development on the device is nearing completion. Some nebulous rumors have suggested Apple too is exploring some similar concepts, working with LG to develop an iPhone with a foldable display. Apple explores many concepts and designs for its devices, so there is likely to be some truth to the rumor. The folding display technology being developed by LG is still a few years off, so if Apple moves forward with some sort of design that's similar to what Microsoft is working on, we won't be seeing it for several years. At the current time, Apple is focusing on edge-to-edge displays and making a transition to OLED technology. In fall 2018, Apple is expected to introduce a second-generation 5.8-inch OLED iPhone X, a 6.5-inch OLED device that can be thought of as an "iPhone X Plus," and a 6.1-inch iPhone with an LCD display that will be available at a more affordable price point. All three devices will feature edge-to-edge displays and no Home button, instead adopting Face ID and the TrueDepth camera system. Finally! I can’t wait to not buy one of these; I’ve always not wanted one! Why don't they just account it when it's ready. It's the equivalent of Apple announcing their car now. The tech press need to up their game. Oh yeah, forgot, the tech press cares about clicks and little else. Microsoft didn't announce anything! Where did you read that or did you not bother to read the article before commenting? Here let me help you. The first sentence of this article: Microsoft is working on a pocket-sized dual-screen Surface device according to information sourced from Microsoft internal documents. Not trying to be a jerk here, just read more than the headline before commenting. I want the folding tablets/phones devices from Westworld. Not sure if this is that exactly. The replies in this thread are so predictable. I guess most are happy with innovation meaning - removal of ports, milking older tech for years, animojis, watch bands, etc.. I think its great that some companies are willing to push the envelope and think outside the rounded rectangle which Apple so proudly defends at all cost. If it runs iOS, I’m in! Why would you want a dumb OS on a pro device? I can't even do something as basic as putting an active SSH session in the background on my iPad without it dying. Why not announce when ready? It's the equivalent of Apple announcing their car, now. The tech press need to up their game. Oh yeah, forgot, the tech press cares little beyond clicks and ad impressions. A point against MR for not mentioning Courier. But...but....does it have a kickstand? Seriously though. The blue screen of death will look AMAZING on this thing. I am a Windows user (at work and home). There are more than 15 years since the last time I had the "blue screen of death". So, switch the speech, we are not in 90's anymore. Love all the hate on something that doesn't even exist yet based solely on a Render, which kinda looks a bit like a foldable iphone 5 which I think might look kinda awesome but again a render, and of course not being an Apple product. I know it's macrumors forum but let's try not to hate on other companies trying to be innovative till its at least on the market. I'm sure reactions would be a lot different if it was an Apple product. Just saying.